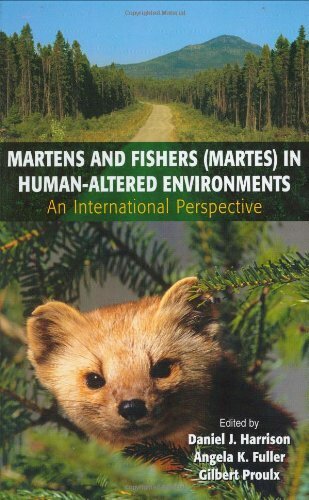 Martens and Fishers (Martes) in Human-Altered Environments: An International Perspective examines the conditions where humans and martens are compatible and incompatible, and promotes land use practices that allow Martes to be representatively distributed and viable. All Martes have been documented to use forested habitats and 6 species (excluding the stone marten) are generally considered to require complex mid- to late-successional forests throughout much of their geographic ranges. All species in the genus require complex horizontal and vertical structure to provide escape cover protection from predators, habitat for their prey, access to food resources, and protection from the elements. Martens and the fisher have high metabolic rates, have large spatial requirements, have high surface area to volume ratios for animals that often inhabit high latitudes, and often require among the largest home range areas per unit body weight of any group of mammals. Resulting from these unique life history characteristics, this genus is particularly sensitive to human influences on their habitats, including habitat loss, stand-scale simplification of forest structure via some forms of logging, and landscape-scale effects of habitat fragmentation. Given their strong associations with structural complexity in forests, martens and the fisher are often considered as useful barometers of forest health and have been used as ecological indicators, flagship, and umbrella species in different parts of the world. Thus, efforts to successfully conserve and manage martens and fishers are associated with the ecological fates of other forest dependent species and can greatly influence ecosystem integrity within forests that are increasingly shared among wildlife and humans. We have made great strides in our fundamental understanding of how animals with these unique life history traits perceive and utilize habitats, respond to habitat change, and how their populations function and perform under different forms of human management and mismanagement. This knowledge enhances our basic understanding of all species of Martes and will help us to achieve the goal of conserving viable populations and representative distributions of the worldÆs Martes, their habitats, and associated ecological communities in our new millennium.